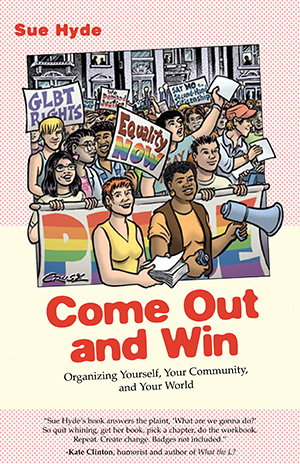 From starting a gay-straight alliance in your high school to the most effective way to lobby your state representative face-to-face, Come Out and Win explains how to organize and become politically engaged in a clear and user-friendly manner. Other issues explored include youth organizing, marriage equality, legislative change, public relations, having a voice in the mainstream press, putting on a street demonstration, and political organizing from local to national levels. Grappling with the complexity of grassroots political interactions, Come Out and Win suggests ways for LGBT communities to form coalitions with women’s organizations, communities of color, and faith communities. —Kate Clinton, humorist and author of What the L?